Delvalle present the new serie Control station & siwtches in GRP for ATEX. it is called CONTREX GRP. CONTREX GRP is for efficient operation and monitoring of multiple electrical circuits and machinery in explosion hazardous areas, control stations can be tailored to exactly meet application requirements. Local ex control stations and motor control stations for use in hazardous and atex areas covering the broadest possible range of applications. Control of equipment at power plants, chemical and petrochemical plants, petroleum refi neries, reverse osmosis plants, pulp and paper processing plants and various industrial applications. Push buttons and selector switches are used in conjunction with contactors or magnetic starters for remote control of motors in hazardous locations. They provide circuit control and/or selection. Pilot lights provide visual assurance that an electrical function is being performed at a remote or hazardous location. For use in wash down areas. Ex Control station can be selected and combined each other. The enclosure made of alloy plastic of static resistance material; GRP, Glass Reinforced Poliamide. Can be used in zone 1, zone 2, zone 21 and zone 22. Components module are mounted on the rails in the enclosure and the cable entries are arranged on the bottom which the plastic molded or metal cable gland can be equipped alternatively. Custom made solutions and very Flexible configure. 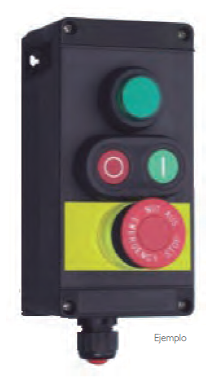 Employs Ex de (factory sealed) operators including push buttons, illuminated push buttons, selector switches, control and load break switches, contact blocks, pilot lights (LED), and terminal blocks. Enclosures are rated for IP66 with firmly secured gasket. Operators and contact blocks are spaced so as to have easy and ample space for wiring. Wide selection of cable glands, union adapter entries at top and bottom locations. Choice of DIN rail mounted high performance contact block suitable for low intensity (less than 5mA). International certification IECEx, ATEX, TUV. Ex II 2D Ex tD A21 T80 ºC IP66.